Erin Greenwell is the filmmaker behind the hilarious “My Best Day,” a small-town All-American lesbian comedy. 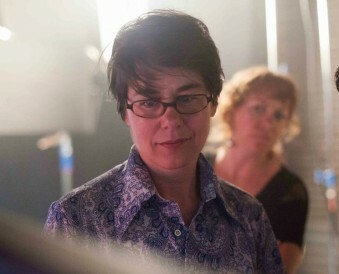 She caught up with Lesbian.com’s Dana Brenklin to discuss the film, her inspirations and big plans for the future. Would you please give the readers a brief summary of your latest film “My Best Day” in your own words? “My Best Day” takes place on the 4th of July in a small town. Karen investigates a phone call from a man she thinks may be the father she never met (she works at a repair shop and a client calls with his name). She drags along a friend, Meagan, to pose as a mechanic to answer the call. When they get to the trailer park, her father isn’t home but everyone else is — a half-brother who is tormented by grade school bullies, a half-sister addicted to gambling and her father’s live-in closeted lover. Karen has until the end of the day to get to the truth and Meagan has to decide whether she is going to choose her stable but “boring” girlfriend or a new fling. How old were you when you knew that film was something you wanted to get into and what triggered it? I was a very shy kid in grammar school and we had to give a presentation on a historical figure for class one day. The night before I watched “Butch Cassidy and the Sundance Kid” with my father and…flash forward to the next day wherein I swaggered out from behind a cubicle wearing a cowboy vest and fake moustache and announced “Howdy! I’m Butch Cassidy! I’m from the Hole in the Wall Gang!” I remember everyone looking up completely surprised. As I kept my presentation going, a part of me floated out of my body and was thinking “I can’t believe this is working!” After that, I became the class mimic. Anything artistic became my way to communicate and be brave. Then when I saw “Some Like It Hot” I was blown away. I could see all the different components to the movie and wanted to be a person that could put that together. It seemed like one big magic trick mixed with storytelling. How far in the future do you see the realization of your ultimate goal of creating a business/arts school for women? Now that I teach at universities and colleges I realize how many administrative things need to be in place to put it all in motion. It’s still something that has been on my mind since I started teaching 15 years ago. I still think it’s important but I’m definitely thinking in decades not years. That said, stranger things have been known to happen more quickly. What do we need to do to create an avenue for more lesbian and/or LGBTQ movies to be made and seen? I think it starts with LGBTQ filmmakers being encouraged by mentors to follow their voices and not be afraid to fail big while they learn how to make movies. Being able to show your work to audience members is critical as well as being able to collaborate with other filmmakers. I’m old school and hope the tradition of going out to a movie, even if it’s in a parking lot or a on a rooftop, continues because an audience doesn’t lie. The best way to learn film, aside from simply doing it, is sitting with an audience and screening. You can feel it in the air while watching with an audience. Of course, supporting LGBTQ distribution companies and press is important because it fuels the exposure they have always fought to bring to us. Although I love the romance of showing in a theater, it has been equally exciting to experience someone from my hometown downloading and watching my movie seconds after posting about it. Do you enjoy teaching film or the doing the actual filmmaking more? I need both to get better at the other and I love both equally but if I only did one I think I would burn out. Students remind me why filmmaking is exciting and making films helps me bring back new life experience to share. Both are housed under the same agenda for me: how can I get a bunch of talented people united to feel clever and happy and work independently towards something seemingly larger than themselves? In that process is already the success of collaboration. Who are some filmmakers that have influenced you? Too many and all the time, but Billy Wilder was the first director to really hook me as a kid. Out of respect for not leaving someone out accidentally, I’m going to stop at Billy Wilder. Do you like being called a lesbian filmmaker or would you just prefer to be called a filmmaker? I’m proud to be called both! LGBTQ characters and storylines are still not always the most sought after in mainstream film. How does this impact your financing and what has been most successful for you? Receiving financing for film is just tough in general, even if you are making a romantic-comedy-bank-robbery-heist with A-list stars. It’s just flat out hard and because distribution is changing so much and distribution dictates investment strategies, it’s even harder. What has been the most successful for me is getting obsessed with making a script, putting my blinders on and just doing it. Not a very practical business model, which has obviously given me angst and debt over the years, hence my desire to have a business/arts school for women. I would sit in on a class. But in all seriousness, it’s just competitive beyond belief, even if you are a “sell out.” The best advice I would give is to love what you are competing for. What was your greatest moment at the Sundance Film Festival? Going to the queer filmmaker’s brunch was powerful because while we were introducing our movies, I looked out and saw programmers from Outfest, Frameline and Newfest that have supported my work since I graduated as an undergrad from college. It made me realize how important mentorship is for LGBTQ filmmakers because if I didn’t have the chance to screen my work, I would never get exposure to better work from more experienced queer filmmakers, meet other filmmakers, and be supported by programmers who were slowly watching me grow over years and years. And again, filmmaking is hard for everyone but all of us there were in the same boat of being proud to be still standing. Most of us started with scrappy self-produced shorts and recognized each other from those festivals over the years. How do you come up with some of the characters you have created? Are any of them based on real life experiences? It’s always a mishmash of what happened, what I wished happened or what I could never imagine happening to me but would be interesting. Sometimes it will start with a line of dialogue, or a single scene or even an ending or a beginning. If the image or dialogue or character won’t go away, I slowly start looping scenarios in towards a larger structure. I am currently developing a script I will direct called “Somewhere Along the Way.” It’s a classic love triangle between two butches and one femme set against the lesbian bar scene in the 1950s. I recently work shopped it at Outfest’s Screenwriter’s Lab. I wrote the script in the 1990s actually and recently picked it back up. Again, I think in decades, not years, but stranger things have been known to happen quickly. Check out Erin’s film “My Best Day” on demand. Dana Brenklin is a Los Angeles based radio personality, award-winning poet and musician. Her radio show, “The Dana Brenklin Radio Show,” airs Thursdays at 9am pacific on kclaFM.com. Find out more at DanaBrenklin.com or listen To Dana’s shows on demand. Posted July 8th, 2013 & filed under Interviews.